Charades (non-competitive): Expand categories and think of animals, insects or vacation destinations to act out for one another with no teams and the simple enjoyment of nonverbal acting and guessing. I Spy Interesting People: Identifying feelings is critical for each child when he or she is trying to become self-aware to be able to communicate her needs and challenges and to develop into her own best problem solver. This is a spin on a favorite game. Creature Sightings: See how many creatures your child can spot outside, including birds, rodents, and insects and keep a running list with photos or drawings. Teddy Bear Tea Party: Have your child set the table with your help for the party. When ready, invite his favorite stuffed animals to join you. Let your child lead the pretend play. Encourage him to teach his guests the rules of the party. Have him serve each of his guest and perhaps, suggest a toast or speech. When someone pushes me, I feel ______________. When I make a mistake, I feel ______________. When I finish a project, I feel _______________. When I help someone and they say thanks, I feel _____________. When someone calls me a name, I feel ______________. When someone won’t share with me, I feel ______________. When someone will share with me, I feel _____________. When someone smiles at me, I feel ___________. When I get a snack I didn’t expect, I feel ____________. Use and add to the poster to help children name their feeling. Draw faces with expressions to match the feelings. Come up with more trigger phrases and feeling words together. Balloon Bop: All should stand in a circle with chairs and all obstructions behind them. Participants need to link arms (holding hands is another alternative). A balloon (not helium) is passed into the circle and participants need to keep it up and inside the circle for as long as possible without unlinking arms or letting it touch the ground. Twister: Five and six-year-olds love this game! Throw the matt out on the floor. Have each player take turns with their moves versus all moving at once to get practice with turn taking. An adult will likely need to spin and provide support with left and right directions. Giggles always ensue. Alphabet or Word Treasure Hunt for Young Children: This is a good indoor game and great for young children who are learning letters or words. Write each letter of the alphabet on single index cards, one per card. Tape a letter or word card to an object that begins with that letter. For example, the “P” card gets taped to the piano. Place the cards all over the house. You can make the placement of the cards easy or hard to find depending upon what kind of challenge you anticipate will be enjoyable for your child. Give your child a full alphabet as a reference throughout the game (if finding letters) and also a gift bag to collect the cards. Now hunt! Each time your child finds a card, in order to “claim the prize,” (a.k.a. put it in his gift bag) he must name the letter (or word). If he cannot, no problem. Look and sing through his alphabet reference and find it together or sound out the word. Hanging up the Anger Suit: Have someone wear the Anger Suit (an old suit, t-shirt or dress). Let everyone know that the suit has magical powers and makes those who put it on instantly and intensely angry. The task is to help whoever has the Anger Suit on, get out of the suit and hang it back up. The only way that they can do that is by following the advice of the audience – anger management experts – who will each offer tips that can help him calm down. 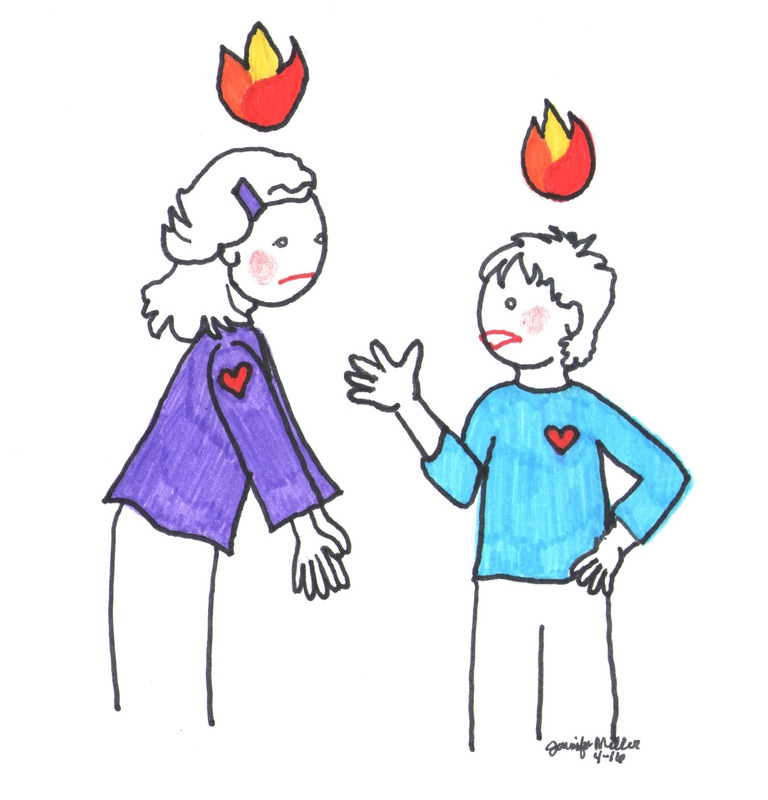 The experts must come up with anger management techniques for example: “anger feels like your heart is beating really fast” and suggest that taking deep, slow breaths will change that. Make a list of the anger diffusion techniques that he group comes up with. As they suggest things, have the volunteer act them out, slowly taking off the Anger Suit as they calm down, until they take it off, hang it up, and return to normal. Give other kids a chance to try on and take off the Anger Suit as the experts suggest techniques from the list. Celebrity Teacher: Circle up. Create a story about their classroom teacher becoming a famous celebrity. Go around and have each child add one sentence to the story. What’s the story? : The ability to understand and articulate someone else’s perspective is a challenging skill even for adults. 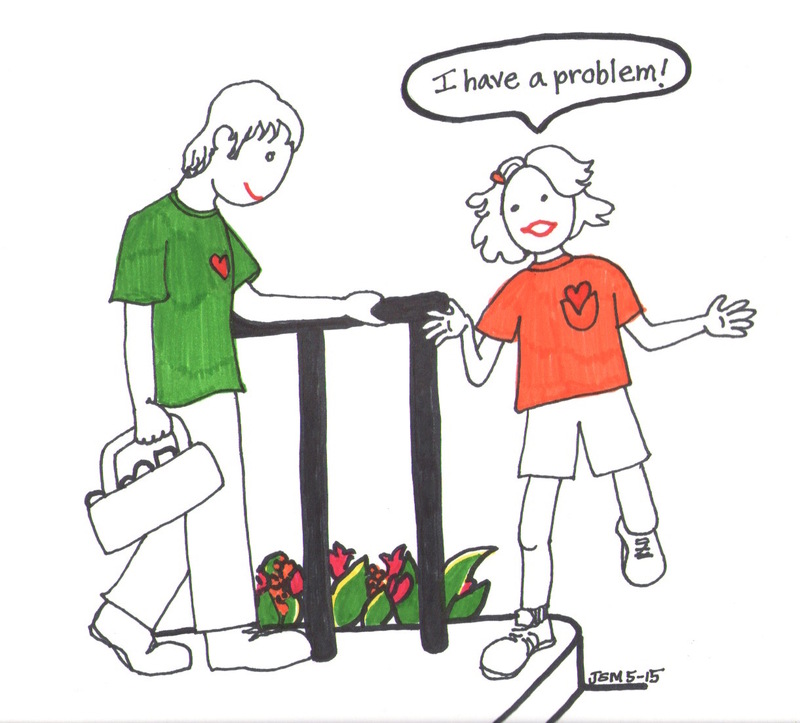 Understanding another’s perspective is a critical part of problem solving and helps a person become more empathetic in any number of circumstances. As with any skill, children will become more adept with practice. Use this game when you are waiting in line or at the park where you can people watch. Find a person in the crowd on which to focus. Now just from her appearance and facial expression, decide what she is thinking. What she’s feeling. Why is she feeling that way? Try to make up either the craziest, silliest story, or the most realistic reason for her feelings. This is a good exercise for teens who attempt to do this all of the time as they size up their friends and classmates. 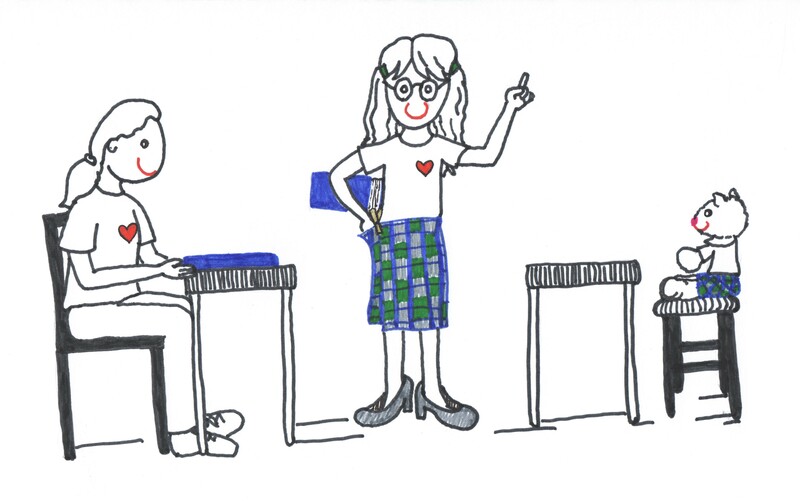 Playing School: Let your child lead the play script. Help him get a school room set up with chairs, chalkboard/dry erase board, favorite books, and other supplies. His students can be you, a sibling and stuffed animals. Encourage him to teach the rules of the class first and then teach whatever he’d like. Who Done It? : Mystery lovers will enjoy this game. It teaches skills in careful listening and communicating information in an accurate and concise way. It also stirs a child’s creative thinking. Pretend that your precious pet turtle was stolen by someone. Describe what that person looked like taking cues from a variety of people around you. “He wore a plaid, flannel shirt and had a large forehead.” He was carrying the turtle in one hand and a flashlight in the other.” You must include 10 details about the appearance of the turtle-napper. Try repeating those 10 details twice for your listener. The listener must be able to repeat all 10 descriptors in order to solve the mystery. Jam Band: Haul out the musical instruments or better yet, invent a few with pots, pans, rubber bands and wooden spoons. See if you can produce music together. Record and play back to listen to your creations. Parachute Play: This one requires a play parachute or a flat bed sheet and it offers a wide range of collaborative games with children holding each side of the material. You can make a tent or bounce balls on the top of the parachute and see how long you can keep them up there. You can also add stuffed animals to volley back and forth. This is a particularly special treat at birthday parties. “Cell-aphone”: Remember the old game “Telephone”? It’s as effective at teaching listening and communication skills as it always has been. Place the kids in a circle. The first child whispers a short sentence in the next child’s ear. Each child passes on what he heard. The last child reveals the message. Giggles ensue when the message invariable changes from start to finish. Reflect by asking: What did we create together? What did it sound like? Pass the Face: This is a game that produces laughter. Circle up and the starting child makes a goofy face at her neighbor. The neighbor replicates that face and must create a new one to pass. Litter Pick-Up: Participate in kindness together by taking care of your local park. Provide gloves for each child to make sure it’s safe. Then see how much litter can be picked up. Lemonade Stand: If you are lucky enough to live on a street where there are lots of children who like to play together, you can turn collaboration into a lesson in entrepreneurship. Setting up a business is certainly a collaborative endeavor if there’s a team putting it together. Children can work together to build a stand, decorate it, create signs to advertise it around the neighborhood, and sell the product to people in your neighborhood. Commercials: Write out value words like “friendship” or “teamwork” or things found in nature like lakes or ladybugs on separate strips of paper. Put the strips of paper in a hat. Sit in a circle and have one person select a word out of the hat. The group should work together to create a commercial for television to advertise the value or natural phenomenon. Have them develop and rehearse it before showing it to you and any other adults you can round up for the audience. It’s an even better and more exciting game if you video tape their performances! Our Town: Cooperatively create a town in the park in which kids can play and bike. Use sidewalk chalk, cardboard, or place traffic cones, sticks or other natural materials to outline your area. Hide the Treasure: Pick anything to be the treasure – a stuffed animal? Someone’s shoe? Have one child leave the room. The other children hide the treasure. When the child returns, the other children must guide her to the treasure without speaking. 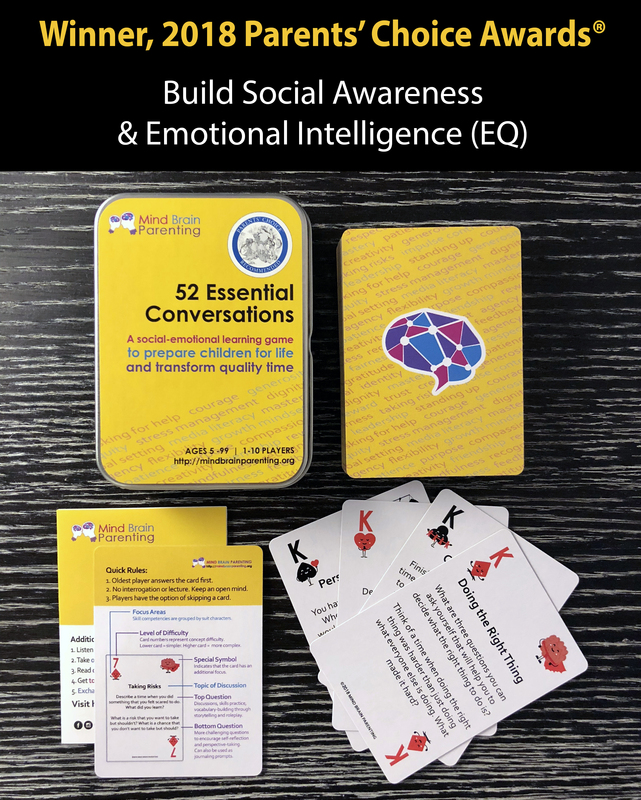 Check out the 52 Essential Conversations Card Game! 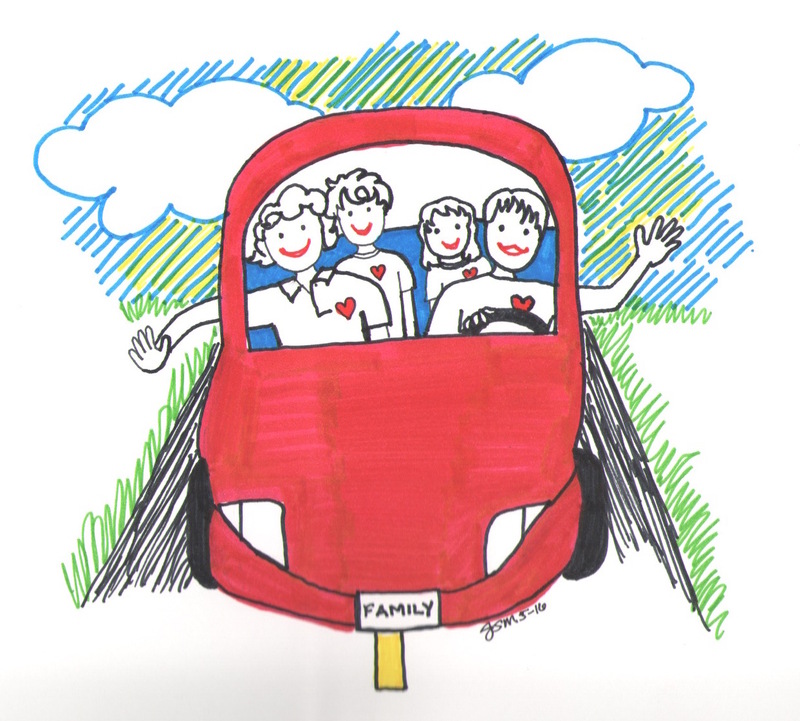 Each card contains a meaningful question that will inspire family dialogue, deepen connections, and teach social and emotional skills. 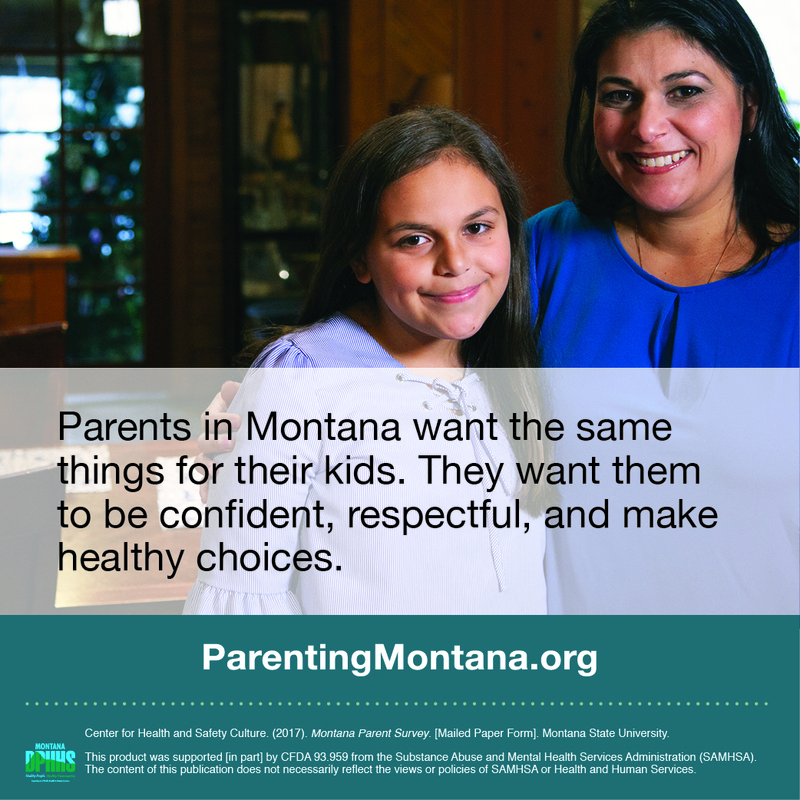 Check out 2018 Parents’ Choice Award winner, 52 Essential Conversations, a social and emotional skills building game available on Amazon (http://amazon.com/dp/B07FKSQV47) and Mind Brain Parenting (http://mindbrainparenting.org). 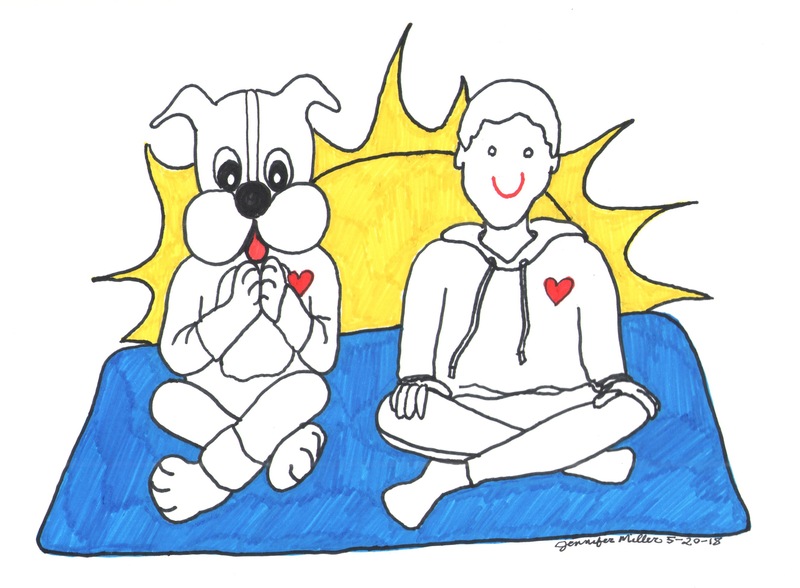 Check out Wuf Shanti for Kids! Rated the “Best Health App and Games for Kids” by Common Sense Media! There’s a tv show featuring Wuf Shanti, an adorable dog character who does yoga with great music and shares with children how to live mindfully, think positively, be kind to others, and live in gratitude on YouTube, Children’s Television Network and local PBS stations. There are animal games too. The organization’s mission is to teach the next generation how to have a yogic-mindset, cope with their emotions in a healthy way, think positively, and spread love and peace. READ THE FULL INTERVIEW AND CHECK OUT THE MANY RESOURCES ON THE WUF SHANTI SITE. A game designed by a scholar of social and emotional learning. These adventures allow for social skill building while entertaining. Correa-Connolly, Melissa (2004). 99 Activities and Greetings. Turner Falls, MA: Northeast Foundation for Children. Freeman-Loftis, B. (2010). Cooperative games for younger students. Responsive Classroom. Kriete, R., & Bechtel, L. (2002). The morning meeting book. Turner Falls, MA: Northeast Foundation for Children. Lattanzi Roser, Susan (2009). 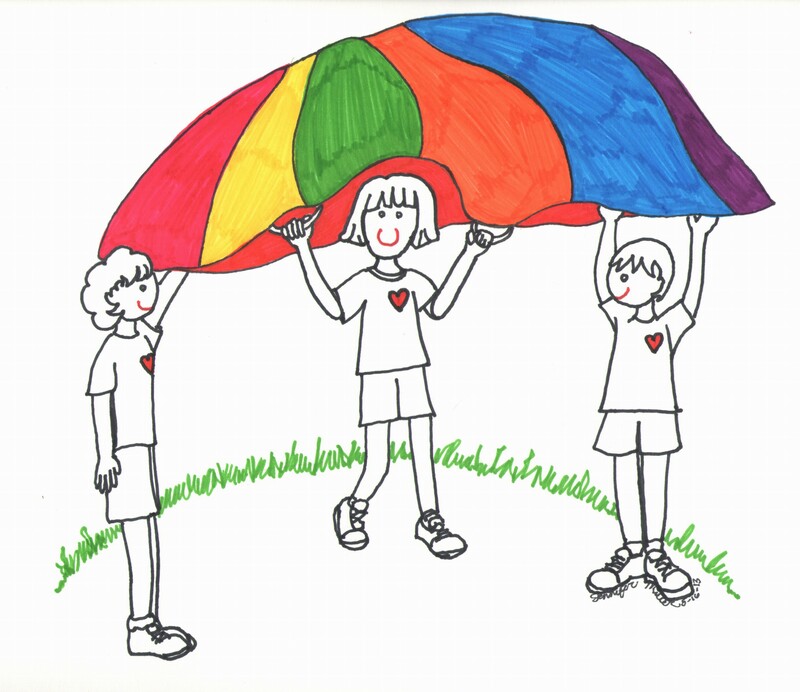 Energizers; 88 Quick Movement Activities That Refresh and Refocus, K-6. Turner Falls, MA: Northeast Foundation for Children. Miller, J. (2013). Let the Games Begin! 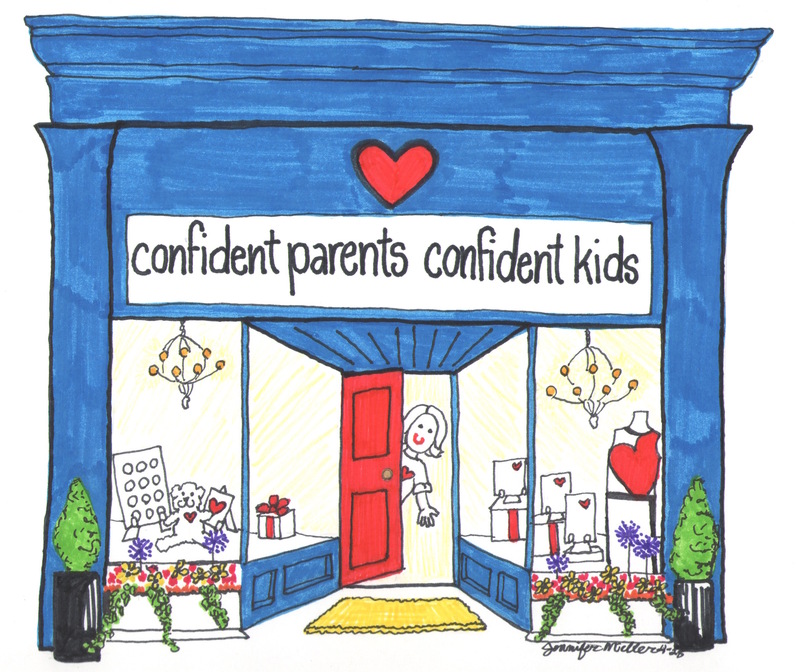 Confident Parents, Confident Kids blog.